Teens Ask - How Do I Get a Driver's License? See the DMV Teen Drivers page for a detailed overview of the process and requirements. After you have held your driving permit for 5 months, and you feel ready to take the "behind-the-wheel" driving test, make a DMV appointment by calling 1-800-777-0133 or make a DMV appointment online (select the Behind-the-Wheel Drive Test option). The California DMV computers only schedule 30 days in advance and appointments tend to fill up - so start early. Calculate the day you will become eligible and make an appointment on or after that date. You don't have to go to the same DMV office that gave you your permit, so look for available times at several nearby field offices if you can. To make an appointment, call 1-800-777-0133 between the hours of 8am and 5pm Monday-Friday. Or you can make a DMV appointment online. Still have questions? 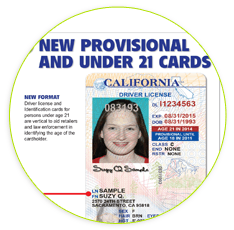 Be sure to check with the California DMV for changes in laws and procedures. We hope you become a safe and courteous driver.